« Is it cruel to keep horses here? “Talk about stating the bleedin obvious”. When I hear the word academic I reach for my pistol. Paragraph 6 of this nonsensical diatribe, which could have come straight from Private Eye’s ” Pseuds Corner”, sums up why the Labour Party and its multitudinous think tanks are unfit for power. I urge you all to read and dissect this complete and utter load of old gobblygook that the writer is, I assume, being paid for in his day job. Could we have an explanation of what is meant in sentence 1 Para 2? Myself and others have tried but we can’t make head nor tail of it. Maybe the explanation for the whole conundrum is the following. 3) The Bangladeshi birth rate. Stay in Oxford. We,ll just get on with life. Part of the reason for the depopulation of London before and after the war was the keenness of the white working class to get the hell out of the East End. That’s why we have Dagenham and Romford, for example, as well as most of the tube map east of Stratford and, further afield, most of Essex built up as far as Southend. And (post-war) Stevenage, Harlow and Hatfield/Welwyn Garden City new towns. It’s worth considering that many people who complain about density are actually complaining about other things. For example, the problem of new people entering an area, is that the area will change and this is discomforting for the existing lot. In the ’80s that change might have been the cafe becoming a curry house, the womanswear shop becoming a sari shop, and the synagogue a mosque. These days you are more likely to see a Bangladeshi lad throwing a brick through the window of the coffee shop that sells cappuccino to a whole new breed of immigrants occupying desirable places such as Arnold Circus. When people say “It’s crowded enough already”, they are not complaining about people like themselves arriving, but about people who are different, arriving. It’s a shame Michael doesn’t give any examples of the good planning. 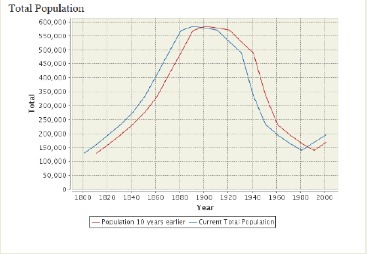 That’s a really interesting take on the population numbers. I wasn’t aware that we’d experienced similar numbers of residents in the past. Point 5 is spot on. It is facilities that we need to concentrate on. A growing population and cash strapped central government – I think we need to be looking at ways to reinvigorate private investment in the borough maybe some innovative public private partnerships? Not sure where the funding will come from otherwise. I think you’d shoehorn those insults into the post whatever the content just because of who the author is. “Talk about stating the bleedin obvious”. Well if it’s so obvious why is it that residents ‘yuppie’ or otherwise have to create freeschools because there aren’t enough secondary schools in the south of the borough? If it’s obvious why hasn’t the planning been done? “Stay in Oxford. We,ll just get on with life”. Notice the correlation between Professor Keith’s departure in 2006 and the boroughs quick decent into chaos and ignominy. With the exception of Cllr Saunders and Francis there really isn’t any new leadership material in that group the sooner Keith comes back the better. What would be of interest is an analysis of what was highlighted in the recent BBC 2 programme about Arnold Circus referred to above. There is anecdotal evidence that the Bangladeshi population of the borough is in fact dropping due to a number of factors. This is certainly the case with Arnold Circus and it would seem that it is happening in other parts of the borough. Planners and those who inhabit think tanks think themselves as those who shape human destiny, this was illustrated in the first of the Secret History of Our Streets about Deptford. The saying in the East End was ” What the German Air Force missed the Labour Party got”. Unfortunately human beings don’t behave the way planners want them to and have nasty habit of wanting to personalize everything. There is a wonderful bit in Tom Wolfe’s ” From Bauhaus to Our House” where one of the Bauhaus school, who had escaped Hitler and ended up in America, designed a block of flats where the blinds could only be in one of three positions. Fully up, fully down, or half way. The philistinic tenants, not realising how lucky they were, insisted on putting up their own curtains of all different designs and colours thereby destroying the symmetry of the block and earning the contempt of the Bauhauser. Some people don’t realise just how privileged they are. I have read and re-read the article and still have no idea what the point of it is. Does anyone? What BBC2 program refers to this? I seem to have missed something. I was talking about the tension created by the new businesses on Calvet Avenue. Yes, what examples are there of ‘smart planning’ in LBTH when the 1911 ‘Mother Levy’s’, the only Jewish Maternity Home in the country, has just been demolished and Spitalfield Market’s London Fruit Exchange of 1929 is now up for demolition? Both examples of the Borough’s built heritage earmarked for the bulldozers by LBTH planners when these buildings could have been retained and adapted. Whether it’s for homes – Mother Levy’s all levelled now by Peabody’s – or existing offices demolished for denser offices for ICAP plc: Spitalfields’ Exchange. Please Professor Keith tell us what ‘smart planning’ is going on. Also when you talk of ‘high amenity’ don’t you include built heritage here…and do you live in such built heritage in Oxford/LBTH or in the ‘high density’ housing you favourably describe? on August 13, 2012 at 3:13 pm HarveyMilk Jr.
Add to that the Mayor selling off Limehouse Library. I don’t think we value our history very much perhaps we could draw up a register of these sorts of historical landmarks and think of new ways we can bring them back into public use. Limehouse Library is Listed by English Heritage, yes(?) so will not get demolished. That List is the only register that matters as the local register: the ‘Local List’ drawn up by LBTH planners, is very exclusive and left off Mother Levy’s and The Exchange – so they could be demolished. Oh and 307 Burdett Road, George Lansbury’s only surviving building, the Poplar Labour Exchange, which got…yes…demolished. It’s not Councillors who want these landmark buildings in Tower Hamlets demolished, for dense housing or dense offices – Mother Levy’s had unanimous, full support from all Councillors but it went on to get an illegal start to demolition, after no public consultation, because of LBTH planners. HarveyMilk Jr, we could draw up a register, suggest all sorts of innovative adaptations and we could get every councillor to agree – as they did in the cross-party decision to refuse the demolition of the existing offices of the Exchange in Spitalfields for denser offices – but it’s the planners who ultimately determine the fate of deliberately(?) unprotected built heritage in Tower Hamlets. As Tom Ridge (local historian) wrote of irreplaceable Mother Levy’s: “All the buildings at the former hospital are being demolished by Peabody, aided and abetted by officers in Tower Hamlets Council but against the unanimous wishes of its elected Councillors. All four hospital buildings on Underwood Road could and should have been adapted for residential use (with the utilitarian buildings at the back replaced by new homes).” RIP Mother Levy’s, unprotected by local planners and thus destroyed. The 1929 London Fruit Exchange is up next, unprotected and further recommended for demolition by local planners as the “benefits” (section 106 money payouts) for new headquarters for ICAP or News International “outweigh the heritage losses.” You see, that’s why we really need to see some of this “smart planning” from LBTH. Just look at the way LBTH treat their old and once-useable large buildings – there’s a common denominator throughout. Southern Grove – allowed to fall into major disrepair. Annex sold off and demolished. LEB Building – allowed to fall into major disrepair. Limehouse Town Hall – allowed to fall into major disrepair. Underwood Road – allowed to fall into disrepair and then sold off and demolished. 41/47 Bow Road – allowed to fall into disrepair. I could go on but you get the picture. That’s just the big buildings – let alone the small ones. Underwood Road – you mean Mother Levy’s, the Jewish Maternity Hospital – had not fallen into disrepair. Disrepair is developer-speak to justify demolition. Same for the Poplar Labour Exchange. These buildings were sound and could have been retained and adapted but local planning didn’t want that as they had – no doubt – promised cleared sites to the developers in their cosy pre-application chats. Campaigners and petitioners did not fight for these historic Tower Hamlets buildings to be saved when they were in disrepair. Of course it was the developers themselves who started true and speedy disrepair to the 1911 Jewish Maternity Home by ripping off the roof. They only got away with it though through LBTH planners. Local ‘conservation'(!) officers could have protected the Maternity Home by putting it forward for Listing by English Heritage – didn’t – put it on the Local List – didn’t – extended the Conservation Area to include it – didn’t – take action after the start of illegal demolition – didn’t… Initially of course the first step in the demise of this unique building was being put on the Disposals list by officers. That is the truth, ‘Truth Hurts’ – no “disrepair” to justify all they have done in getting it demolished. Southern Grove – thought Tom Ridge (local historian) had tried to save it, so imagine again he would know it was not beyond repair. LEB Building – have heard that may be in trouble because of LBTH neglect. An amazing building and a scandal if that goes. Limehouse Library – Clem Attlee statue removed from the front to the campus of Queen Mary College was the start of the degradations. Listed though so at least will have to be repaired. English Heritage will make local conservation do something, if Listed by them. 41/47 Bow Road – the old planning office/former dog biscuit factory? – that is now being re-used by the relocated-from-Tredegar-Square-Listed-Schoolbuilding-to-be-converted-into-pricey-heritage-flats Central Foundation Girls School. So not demolished. So beyond the LEB building, just do not buy this disrepair line. There is no justification for LBTH planners and what they are doing to built heritage in the Borough. Oh and let’s add Cheviot House, a great Art Deco architect-designed building and surviving Jewish textile factory that has been left unprotected by local planning for those developer pals, to the great Art Deco architect-designed London Fruit and Wool Exchange. There was even an ‘LBTH Planning Brief for the London Fruit and Wool Exchange 2005’ which directed that the council wanted the ‘retention and refurbishment’ of the existing historic offices of the Exchange…but only the developers got to see that council document. “Smart planning” is the kind in the Planning Brief above – for our built heritage – but officers are not doing it in local conservation. Really would like to see what Professor Keith means as it cannot be for historic buildings. Sorry the last Post should read Limehouse Library – allowed to fall into disrepair. Limehouse Town Hall is being used by “community groups” and is in reasonable repair – for now. It does look very rough compared to how it used to look in it’s former splendour. I haven’t got a clue what point Michael is trying to make. I think Labour’s planning decisions in LBTH have been a catastrophic failure. Unaffordable homes and office blocks no-one local can get a job in. That’s why Lutfur is Mayor and Michael isn’t. @ The Truth Hurts – Yep, what a local authority should do spend taxpayers money mothballing buildings it doesn’t need. Sod having some of the best social services and education in the country, Tower Hamlets should spend all the money on looking after an ugly surplus 1950s office block. The reality is it has to prioritise. I meant the former LEB building. What buildings were sold off to invest in what school that has become an academy? This is simply an anonymous slur against me yet again. At least I identify myself so that you can pillory me. Oh well, plus ca change! For the record, the academy I’m involved in (whilst it was still a maintaned school) received BSF money via LBTH from central government. I wish we’d had the money to knock down the victorian block that we have and build something with more floors on the same footprint and same height and created more outdoor space. Ideally something really bland in concrete and glass just to piss off people like you. Anyway, you somewhat prove my point – education, health and housing are more important than empty unneeded buildings that cannot reasonably practically be put to other use. I’d happily see the LEB building, Cheviot House , Southern Grove, Limehouse Library, Limehosue Town Hall, St Clement’s Hospital and anything else you cherish bulldozed and turned into community land trusts. The reason your so-called “locals” cannot get a job in those offices is because the majority of the locals you are speaking of have a ghetto-mentality (encouraged for decades by Labour), are only able to speak pidgin-English, are incapable of behaving in an appropriate way around young women and have a dreadful ‘attitude problem’ that is entirely unsuitable for a mainstream office environment. I remember the CSR department at my firm used to bring in occasional ‘local youth’ from Tower Hamlets for work experience to try to help them out but these lads would invariably be highly argumentative, refuse to do jobs appropriate to their level of qualification and ask the boss’s secretary if she “was up for it” and “how many boyfriends” she had. In the end CSR gave their money to a tiger charity instead because it was much less hassle. Welcome to the Big Society. Funnily enough that’s exactly the same beahaviour that I’ve regularly seen demonstrated by public schoolboy Oxbridge types. If kids behave like that it’s because their aspirations are never raised. of course there are a lot of people in Tower Hamlets whom it suits to keep the kids in teh ghetto. I am shocked that Graham is not Mad Mullah. ha ha ha ha – Thanks Dan, it’s nice to think you think I read Wolfe! I always thought Bauhaus was German for kennel. So you’ve got two notches on your belt for Mother Levy’s and Poplar Labour Exchange. Still not enough obviously. At least on Alice Model’s Mother Levy’s and Lansbury’s Exchange you are in the minority and these buildings were bulldozed against the wishes of local councillors (on all sides) and hundreds of local people. You and the handful who have profited from these demolitions should be ashamed of yourselves. Bulldozed those for “community land trusts”? – yeah right. Oooooh, another anonymnous libel against me on Ted’s blog. Please explain how I’ve profited? And please, calm down and read my posts again. As I’ve tried to explain – development has been the thorn in the side of the Labour Party in Tower Hamlets, and the rush for s106 money has been a disisater for the borough. I beleive community land trusts are the best way of developing social housing – and that LBTH should look at disposing of sites such as the LEB building (sorry, but exactly what redeeming features does this monstrosity have?) on this model. But the tree hugging Guardian reader – which I suspect you are – will always be more interested in phoney heritage than progress. I dare say you’ll be able to get a petition together – but your campaign is more astroturf than grassroots. The big money in the demolitions of Mother Levy’s and the Poplar Employment Exchange was actually made by Peabody and Telereal Trillium. Tower Hamlets got how much for levelling East End heritage here? Neither did you get community land trusts, either. Telereal Trillium flattened Lansbury’s Exchange and put a separate entrance for the ‘social housing’ element in their canal-side scheme; now they are selling the demolished site on to make even more from it. Peabody destroyed Alice Model’s Jewish Maternity Hospital in Spitalfields and only 9 out of 33 homes will be ‘social housing’. But that’s all good for you and the developers, and the opposition of hundreds of residents with genuine petitions against these demolitions are just “astroturf”, right? We shouldn’t bother doing any petitions because officers will just keep on recommending demolitions/bad schemes? 30 out of 850 homes for affordable social housing on this ASDA site on the Island but officers recommend the scheme – probably find that Cubitt Town Library is back on the disposals list as officers again try to sell our libraries. It is particularly nasty that you insult those residents who are campaigning to save East End heritage. It is not “phoney heritage” either. Mother Levy’s, the Poplar Labour Exchange (and Bancroft Library) all had sound petitions, signed by hundreds. They were not “astroturf” and not comprised of ‘tree-hugging Guardian readers.’ Neither are current campaigns: ‘Save the George Save Stepney’s’; Save KEMP and Save the London Fruit and Wool Exchange etc, etc.